Earn $45.89 in Rewards credit (4589 points) What's This? 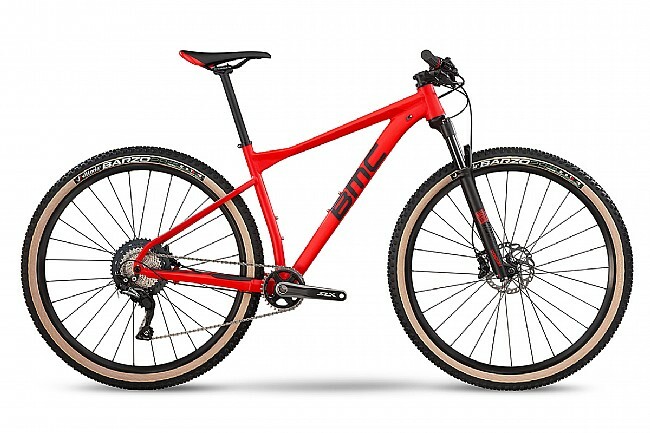 The 2019 Teamelite 03 ONE Mtn Bike from BMC is a light yet stiff 29er mountain bike with triple-butted hydroformed aluminum tubing, a RockShox Recon RL, Solo Air, Remote (100mm), 15x100mm thru-axle fork, and greater compliance and comfort thanks to the lowered seat stay and Angle Compliance Technology. Tubeless rim strip installed; valve included. Frame: Teamelite 03, Big Wheel Concept, Al-13 Premium Triple-butted, Hydroformed Aluminum. Fork: RockShox Recon RL, Solo Air, Remote (100mm), 15x100mm thru-axle. Headset: Tapered Integrated 1 1/8"-1 1/2". Rear Derailleur: Shimano SLX, Shadow Plus. Bottom Bracket: BSA Threaded Bottom Bracket. Handlebar: BMC MFB 03, 750mm. Axles: 15x 100; 12 x 142mm, thru-axle. Tires: Vittoria Barzo TR, 29x2.25. Weight: 1540g (Frame only, size M). Manufacturer Warranty: 3-5 years for frame; 2 years for paint.